By the Heian period (794-1185), chrysanthemums or kiku were also cultivated as ornamentals in Japan while the plant’s medicinal qualities have been celebrated since pre-Nara period (pre-710). 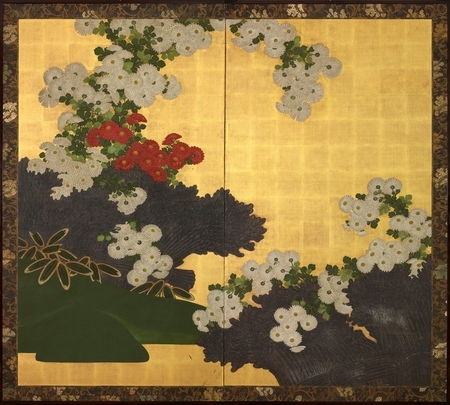 The Edo period (1603-1868) was a time when gardening boomed and from the early Edo period, as enthusiasm for gardening grew, various species of chrysanthemums were produced and the flower shows for new types of chrysanthemums called kikuawase (chrysanthemum matching) were also held amongst the people. 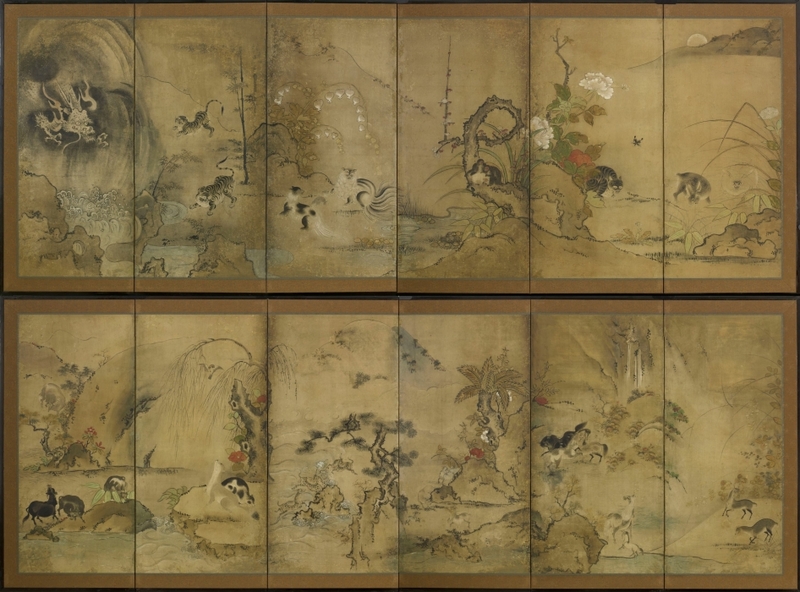 Japanese interest in chrysanthemum as a theme for poetry also developed during the Heian period. At that time, with the evolution of a native artistic sensibility heavily influenced by the passing seasons, the flower gained its place as one of the premier symbols of autumn. In many instances, the flower appears in ensemble motifs with all or some of the Seven Grasses of Autumn, and it is sometimes included in enumerations of this group. The first use of chrysanthemum as a symbol of the Japanese Emperor and the Imperial family occurred in the thirteenth century when Emperor Go-Daigo adopted the flower as a crest and it was continued by successive Emperors. Later many commoners also used chrysanthemum as a family crest, and a Matsuya store catalogue of 1913 included 95 crest designs based on this flower. Categories: Screens, Two Fold. Tag: kiku.